You don’t have to worry about having a small yard. Make the most out of it this spring with help from your local landscape supply store and design company, Lehnhoff’s Design & Supply. You don’t have to worry about having a small yard. Make the most out of it this spring with help from your local landscape supply store and design company, Lehnhoff’s Design & Supply. After all, you have a huge variety of options to make your landscapes look better and accentuate the look of your home’s exterior. Here’s a look at some of the basic principles of landscape design and how you can pull this off. Before you can go about making your yard, you need to be honest with yourself. The size of your current yard will determine how much you can alter it. After all, even if your yard is 10’ by 8’, for instance, you might have landscaping features such as bushes, trees, and garden spaces. You’ll also have to think about some other factors that are as essential as dimensional measurements, such as the weather conditions you can expect on a daily basis; if your yard is sloped; and lastly, the type of soil you have in your yard. Next, you’ll need to consider what you do in your yard. Turning your yard into an outdoor living space and a place to host spring and summer parties will have radically different landscape supply needs than if you want a quiet oasis as a hideaway from the world or a place to establish a garden for your fruits and vegetables. How you currently use your yard and what plan on doing in the future will not only influence your dreams of expansion but also how to walk through your yard, too. Don’t forget to visualize how you will move around in your redesigned yard. Putting up fences and gates can define where the yard begins and ends, and how you can come in or go out if you are not entering your yard through the house. Don’t forget to figure out where you’d like to place your chairs and tables, along with your hardscapes and pathways. At the end of the process, you’ll want to make sure everyone can reach the best-looking parts of your landscape without too much difficulty. Lehnhoff’s Landscaping is delighted to introduce Lehnhoff’s Supply and Design. 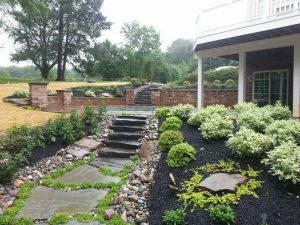 We seek to fulfill all of your landscape supply and landscape design needs no matter what project you’re looking to complete. We are based in Fallston, Maryland and are eager to lend you our expertise and materials. Find us at 2708 Belair Road, Fallston, MD 21047. Call us at 410-510-7646 or drop us a line via email at lehnhoffsupply@gmail.com. Lastly, don’t hesitate to reach out to us on Facebook, Twitter, and Google+! We serve, but are not limited to, the following parts of Maryland: Harford County – Fallston, Forest Hill, Joppa, Edgewood, Bel Air, Churchville, Havre de Grace, Jarrettsville, Street, Aberdeen, Abingdon, and Joppatowne. This entry was posted on Thursday, April 19th, 2018 at 1:52 pm. Both comments and pings are currently closed.